A wonderful family holiday. Perfect villa and location. In a fabulous setting with panoramic sea views, Villa Talya is an ideal base for your family holiday. Built over two floors the villa is spacious and welcoming and offers 5* facilities. There is a modern yet comfortable feel with air conditioning, tiled floors and stylish furniture. This villa is ideal for: 1) families with babies, children and teenagers or 2) families with grandparents Villa Talya is a luxurious fully air-conditioned villa, well equipped 4 bedrooms 2 bathrooms, 2 toilets villa with private pool, with stunning mountain and sea views. 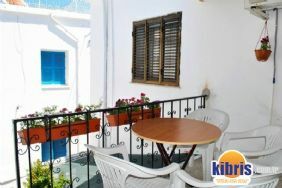 Superb location close to Turtle Beach and the Korineum Golf Club and 20 minutes by car to Kyrenia. For al fresco dining there are tables and chairs, a stone barbeque. Steps descend to your private pool where there are sunbeds and umbrellas for shade. The pool light stays on so you can enjoy an evening dip.